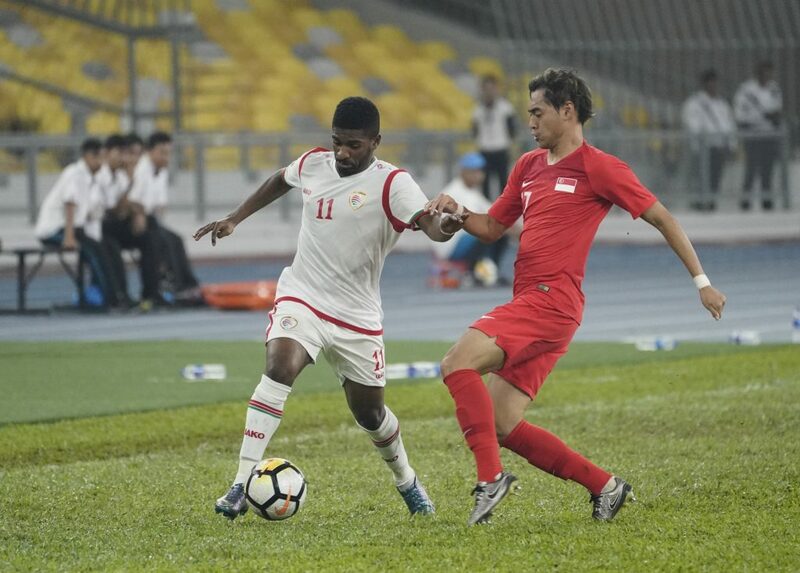 KUALA LUMPUR, 23 MARCH 2019 – A sensational late goal from Zulfahmi Arifin saw Singapore hold Oman to a 1-1 draw on Saturday night in the AIRMARINE Cup 2019 final. The midfielder’s brilliant free-kick on 93 minutes levelled the game and took it to penalties, where Faris Ramli was unfortunate to see his kick come off the bar. The Lions may have lost the shootout 5-4, but can be proud of how they battled an opponent ranked 75 places above them by FIFA at Bukit Jalil National Stadium. It was achieved with a starting line-up that saw four changes from the side that beat Malaysia three days ago as Nazri Nasir brought in Zaiful Nizam, Faritz Hameed, Izzdin Shafiq and Gabriel Quak to stay true to his word that he would freshen up the team. Zaiful, in particular, put in a solid display as he came off his line smartly on two occasions to foil Oman and was commanding in claiming crosses, while he also made a string of saves to deny the likes of Raed Saleh, Aziz Al Maqbali and Ahmed Al Mahaijri. The Balestier Khalsa goalkeeper could not do anything about the first goal though, as Raed was sent clear down the left before crossing for Al Maqbali to head in from close range in the 28th minute. The Lions were far from overawed and burst out of the blocks in the second half and just three minutes in, the tireless Khairul Amri set up Quak to cross for Faris Ramli, whose header was well saved. Yasir Hanapi then headed a cross wide before Faris was correctly flagged for offside, having finished off a one-on-one situation. Captain Hariss Harun was brought on to reinforce the midfield on the hour mark and Nazri subsequently put in Zulfahmi and Khairul Nizam, as the Lions made a late push to salvage the game. The head coach’s changes would pay off in the final minute of added time after Nizam earned a free-kick about 23 yards out. Zulfahmi, making his 40th international appearance, stepped up and curled a sublime effort into the top left corner on the goalkeeper’s side for his first Singapore goal. 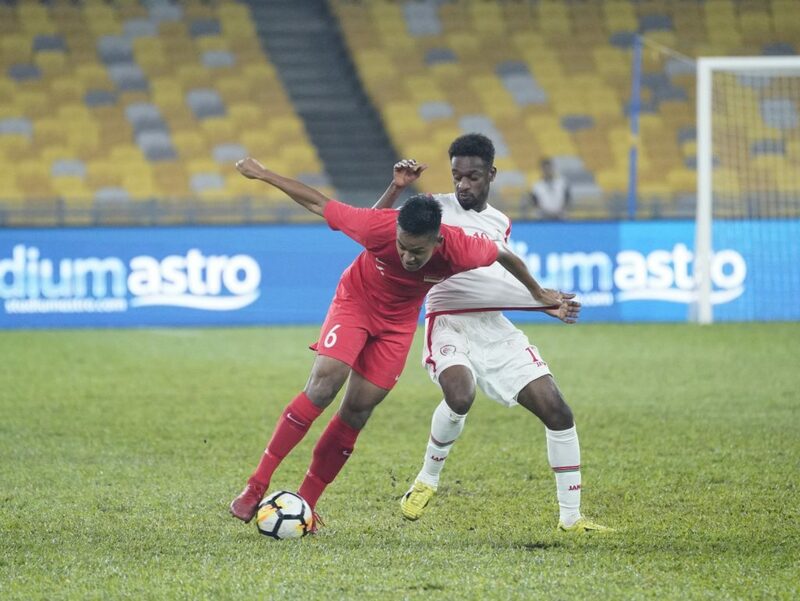 In the shootout, Safuwan Baharudin, Yasir and Amirul Adli all scored from the spot before Faris smacked his penalty onto the bar to give Oman the advantage. Despite Hariss scoring the fifth kick, Raed’s successful final kick meant Oman scored all their penalties and claimed the AIRMARINE Cup. While the Lions will not return with the trophy, the draw halted a run of eight straight defeats to Oman and ensured that they are unbeaten in both international games this year. Singapore: Zaiful Nizam (GK), Faritz Hameed, Amirul Adli, Safuwan Baharudin (C), Irwan Shah, Nazrul Nazari, Izzdin Shafiq (Zulfahmi Arifin 74’), Yasir Hanapi, Gabriel Quak (Hariss Harun 62’), Faris Ramli, Khairul Amri (Khairul Nizam 81’). Unused subs: Izwan Mahbud (GK), Syazwan Buhari (GK), Emmeric Ong, Huzaifah Aziz, Shahdan Sulaiman, Anumanthan.